I have two different English curriculum's my boys used last year and I will not be upgrading. I've noticed there is very little difference between the third grade edition and the fifth grade edition. So I have come to the conclusion that language is repative year after year while adding in some new concepts. I've also noticed that while old concepts are always gone over again and new concepts are introduced quickly. I have decided to look at books for teaching grammar in the middle school years instead of buying more curriculum. I plan on using it as a supplement, but also to help the boys grasp a better understanding of what they are learning. I believe this will help them to retain better. I'm including links where I have searched in hopes it may be helpful to someone else who feels the same way. I really appreciate the sites where we can look inside the books it makes easier to decide if we think the book will be right for our families. Another important thing I'm looking for is something both of the boys can use at the same time. I looked at Winston and while I like the look it appears to be another English curriculum which is what I'm trying to avoid. Easy Grammar looks great, but once again it is a regular curriculum. If I had to chose a curriculum I would use Easy Grammar. 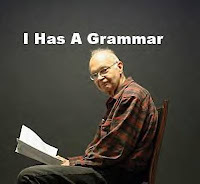 My picks from Amazon include Teaching Terrific Grammar, Fun with Grammar, and Hot Fudge Monday. I do not think I will use them all, but I will report back what we used and not only my thoughts but the boys as well.